Building a 10G. 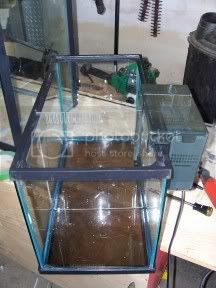 frag tank for S.W. Posted: 2006.07.12(Wed)23:17 Post subject: Building a 10G. 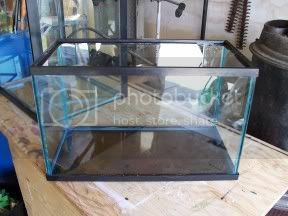 frag tank for S.W. Here's my latest project, a small frag tank for S.W. 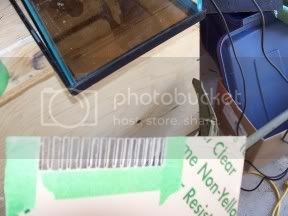 I will touch on the construction phases here and if someone wants a more in depth description of how I did things they can use the link at the bottom of this post. I used the same techniques in that project. I am using a standard 10G. 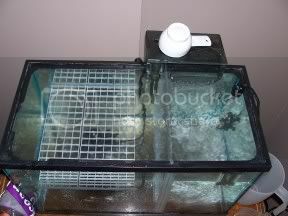 glass tank, an Aquaclear powerfilter, a Hydor powerhead with rotating outlet, some suspended ceiling light diffuser (eggcrate), a heater, silicone and Plexiglas. Here's the tank. I want to convert it into a 6G. 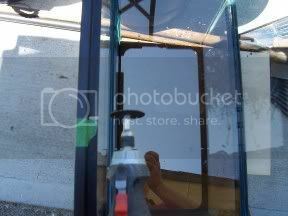 display with a 4G. sump. 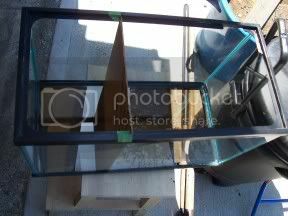 I positioned the A.C. unit on the tank to see where the divider should be. I want the flow from the return spillway to create turbulence across the whole sump so I won't need an additional powerhead. Using a square I mark both edges so the divider will not be cockeyed. 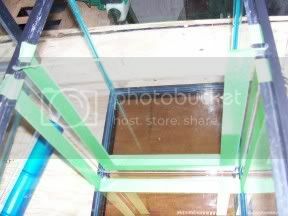 Here's the plexi divider in the slots. Note that I have left the protective backing on for now (to prevent scratches). I also have to notch the A.C. unit so that it will straddle the divider. This doesn't compromise the performance of the filter at all. 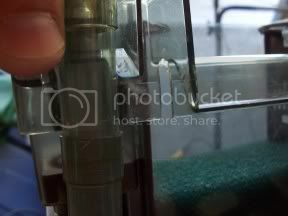 And this is how the filter sits on the tank. 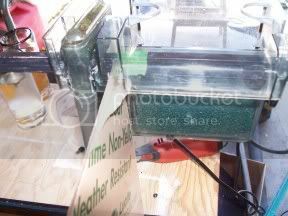 The intake draws water from the display area and returns it to the sump. 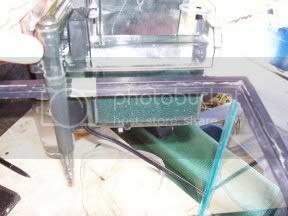 Using the dremel again, I cut straining teeth into the divider so that the water from the sump can return to the display. And here's how it looks. Here I am preparing to silicone the divider in (I've taken the backing off now). Silicone does not bond well to plexi so I am running two beads on either side. 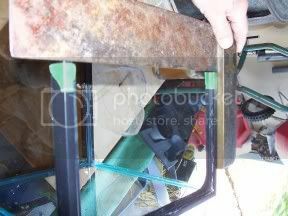 These will sandwich the plexi in place (it's not a load bearing bond anyways). And here's the silicone. Using masking tape (and removing it when the bead is smoothed out) creates a nice clean line. 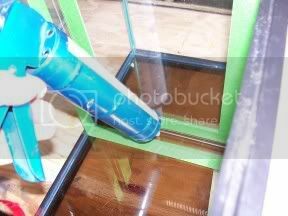 While I'm at it I will create two beads of silicone on the sides of the display portion. These beads will support my eggcrate shelves. If I want to convert this to a little nano display later on I can just remove the beads with a razor blade. Here's a shot showing the shelves resting on the silicone beads. Note the heater in the sump. Tomorrow I will add some live substrate from my big tank. In the display I have a little powerhead with a rotating head pointing up towards my frag shelves. The flow is good! 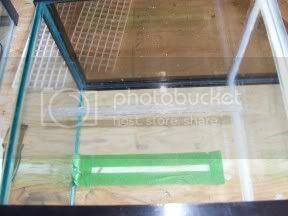 Because it is a frag tank for now, I will keep the display bare bottom (to help keep it clean via P.W.C. 's and vaccuming). I may put a light over the sump and try growing macro algae as well, but for now, my main concern is hopefully nursing some filter feeders back to health. I'll post the completed set up tommorrow. Wow. You always have some good ideas up your sleeve don't ya. If at first you don't succeed... skydiving is not for you. Here's the completed project for now. 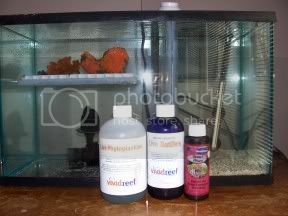 I am dosing with Vividreef live phytoplankton, Vividreef live rotifers and Seachem reef plus (vitamins and amino acids). Here's my chili coral. Lately, it hasn't exhibited the polyp extension that it once had and some necrotic spots have developed. I plan to zip tie it upsidedown on the underside of the eggcrate to help it inflate more easily. 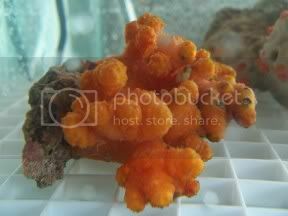 Here's the Sun coral. Hope it gets better as it is quite beautiful when fully open. The white areas are where it has died off. Oh wow. 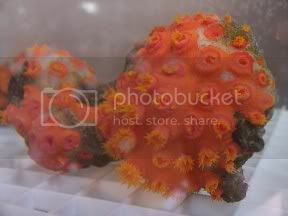 Would you be so kind as to post some pics of the sun coral when it is opened??? I love sun coral, but I don't plan on trying it in my upcoming SW.
very cool what are you using for lighting on that. 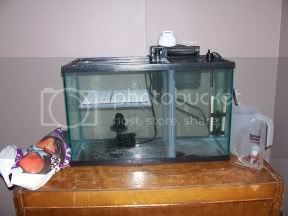 I want to do the same thing with my sump tank. Right now there isn't a light. The corals selected are not photosynthetic and lighting just encourages nuisance algae growth on them. If I want light I might put a small P.C. on the display. Ahhh, Dale has the Dremel tool out again... great post and pics, thank you for sharing. Haha... I was just going to say that! I love reading your "How-To" threads, Dale. The pictures and explainations, as always, are great.